Many performance metrics are as old as the contact center industry itself, and are still in widespread use. But as new communications channels such as social media emerge, and as the definition of efficient customer service evolves, new metrics are gaining the attention of the industry. 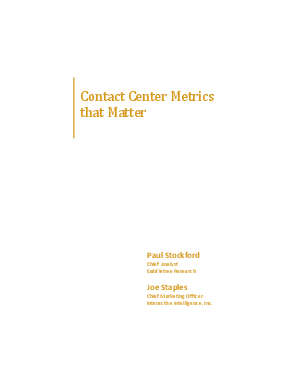 Paul Stockford of Saddletree Research and Joe Staples of Interactive Intelligence explore some of these “metrics that matter,” and discuss how they’re changing the definition of the contemporary contact center.